Even if you don’t have room to rehome a hen, you can still adopt one of our girls with a Sponsor a Hen pack. 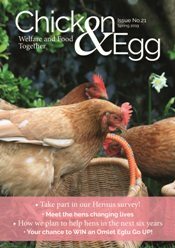 Sponsoring a hen for 12 months at only £4 a month is the ideal way to get to know a hen and learn about her adventures as she enjoys her free range retirement. We’ll send an initial sponsorship pack containing everything you need to know about your chosen feathered friend, as well a six month update to let you know how she is getting along. You can also choose to pay £48 up front. These packs are lovely to keep for yourself or to give as a gift to those family members who are particularly hard to buy for! Whatever your reason for sponsoring one of our hens your sponsorship will go towards saving more from slaughter. 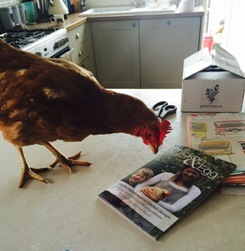 So sponsor a hen and follow her as she discovers the wonders of the outside world and relaxes into retirement. And help other hens at the same time. Simply pick your chosen hen below to get started! Sage was rehomed from our Cheshire collection point in January 2019 along with her sisters Rosemary and Parsley. Bonbon is a super sweet name for a super sweet hen! Despite a tough start to her free range retirement, Bonbon is loving life in her new home. Lucille started life as a nervous, tatty-looking hen, but she soon rose through the ranks to establish her position near the top of the pecking order!